LONDON (Reuters) - The Archbishop of Canterbury said the Church of England still held an indirect investment in short-term loan company Wonga, even though he branded its activities "morally wrong" nine months ago. Archbishop Justin Welby, leader of the world's 80 million Anglicans, said last year he had been embarrassed to learn that the church's pension fund had invested a relatively small sum in a U.S. venture capital firm that led Wonga's 2009 fundraising. Shortly before that investment came to light, Welby had pledged to drive such lenders out of business by backing rival credit unions as he made a scathing attack on so-called "payday" lenders such as Wonga, which charge high interest rates on loans that are typically repaid when borrowers receive their next paychecks. 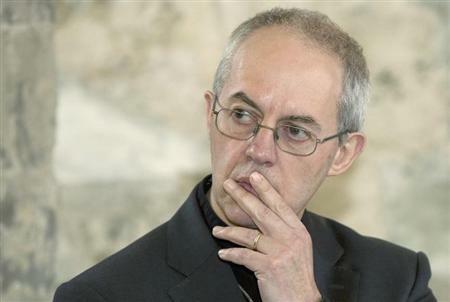 But on Sunday in an interview with The Sunday Telegraph newspaper, Welby said he had been unable to force the church's investment arm, the Church Commissioners, to exit the investment. "I can't just say, 'Sell it'. I do not have the authority to do that," he told the newspaper, saying he had already urged it to get rid of the investment "several times". "When I last asked, which was about a month ago, they hadn't. It's a very small holding of about 85,000 or 90,000 pounds ($151,300), which is indirectly held through about three other holdings, and apparently it is very difficult to get rid of." The fund was working on trying to offload it, he said.